Central Maine Community College (CMCC) has announced it has joined Achieving the Dream (ATD), a network of more than 220 colleges in 39 states dedicated to improving student success. As a Network institution, CMCC will work closely with national experts over the next three years, using evidence-based approaches to improving student outcomes. “Achieving the Dream is a growing network of more than 220 community colleges committed to helping all students achieve their goals for academic success,” noted Betsy Libby, academic dean at CMCC. “The goal is to close academic achievement gaps and accelerate student success by examining data and building on the College’s capacities in seven essential areas, such as leadership and vision, teaching and learning, and data and technology,” Libby added. The ATD Network offers a “capacity-building framework” and self-assessment tools that allow colleges to pinpoint strengths and areas for improvement across those seven institutional capacities. The approach integrates and aligns existing college success efforts and offers valuable support in making bold, institution-wide changes. A team from CMCC met with teams from other colleges in February and June to prepare to launch their ATD work. Colleges in the ATD Network will rely heavily on data that answers critical questions about who attends college, who succeeds and why, and how students pay for their education. To advance the goals of academic success and social mobility, the colleges will examine data metrics that provide information on how low-income and other underserved students perform. These are categorized into performance metrics, efficiency metrics, and equity metrics at points during the student experience from access through post-college outcomes. As colleges progress through ATD, they may apply to participate in initiatives that can help them refine practices based on sound evidence of what works. Read more about ATD at achievingthedream.org or follow them at on Facebook @AchievingtheDream. Photo caption: These faculty and staff members comprised the CMCC team that participated in the Achieving the Dream conferences earlier this year. 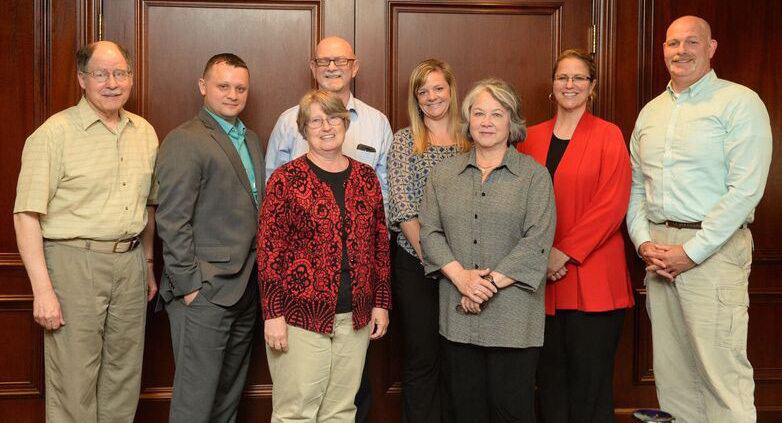 Left to right are John Wallace, mathematics instructor; Nick Hamel, dean of student services; Kathy McManus, chair of the nursing program; Ron Bolstridge, director of institutional research; Betsy Libby, dean of academic affairs; Ethel Bowden, chair of the humanities department; Anne St. Pierre, associate dean of academic affairs; and Mike Henry, business instructor.